How Far Along: 13 weeks! Weight Gain: only 1 pound so far! But I'm bracing myself. Stretch Marks: Not yet and I'm already keeping very moisturized in an effort to avoid them. Maternity Clothes: Not quite yet. I'm using a BeBand with some of my pants that are too snug to button now, but the majority of my shorts are low rise so they are still fitting comfortably. Movement: I'm not feeling any movement inside, but I'm moving a lot! I'm taking prenatal yoga and continuing to run as much as possible. Sleep: Waking up several times throughout the night and requiring more sleep than normal, but sleeping soundly all the same. Missing: Subs. I'm home and we have the best subs here and I can't eat them! I know, I know...I could have them heat the meat, but that just sounds gross to me. Loving: My bump! I'm finally starting to look like I'm pregnant, not just over-indulging! Craving: Lemon and vinegar anything. Adding lemon juice to my water and pouring vinegar on my French Fries. Also loving raw fruit and vegetables - pears, watermelon, carrots, apples. Feeling: Normal! Now that I'm over morning sickness and able to continue exercising I forget that I'm even pregnant. Looking Forward: Relishing every moment. I know this is going to by way too quickly and I am thoroughly embracing and drinking in every single moment, memory, and milestone throughout these 9 months. I am 100% in love with being pregnant. It is such a miracle. Also excited that this is my last week in my first trimester! Best Moment(s): Sending my husband a picture (we are away from each other for 2 weeks) and having him exclaim, "Did you stuff a pillow under your shirt?! "; seeing my family this week and just being home in the North Country - there is nothing quite like it. I'm going to attempt to post a ::bumpdate:: each week on Monday. One thing about the North Country is spotty cell and internet service so forgive me for being late this week. 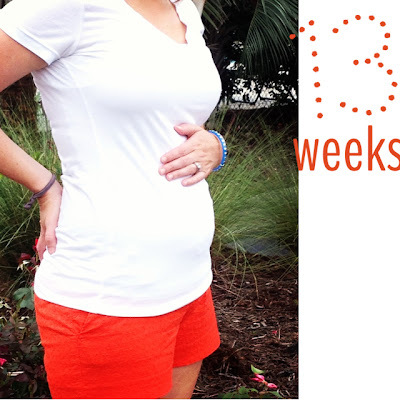 Check back tomorrow to see a recap of my first trimester! I love these! I look forward to reading yours and Nicole's. So excited for you! Can't wait to see how you announce the gender! YAY!!!!! loving reading your updates! Girl - I'm due 1/11, I bet you are due the same time??? I was also 13 weeks as of Saturday!